Fairbanks, Alaska (AK) – Summer Solstice, on June 21st, is Fairbanks, Alaska’s most celebrated summer holiday. Because Fairbanks is located at 65 degrees north latitude, the sky never gets dark for up to 24 hours per day during Midnight Sun Season, April 22 through August 20. Summer Solstice is the apex of the Midnight Sun Season. Three long-standing events that capitalize on the everlasting sunshine include the epic Midnight Sun Festival, the Midnight Sun Baseball Game and the Midnight Sun Run. Held annually from noon to midnight on the Sunday closest to Solstice, the Midnight Sun Festival is Alaska’s largest single-day event drawing up to 30,000 sun-worshippers. 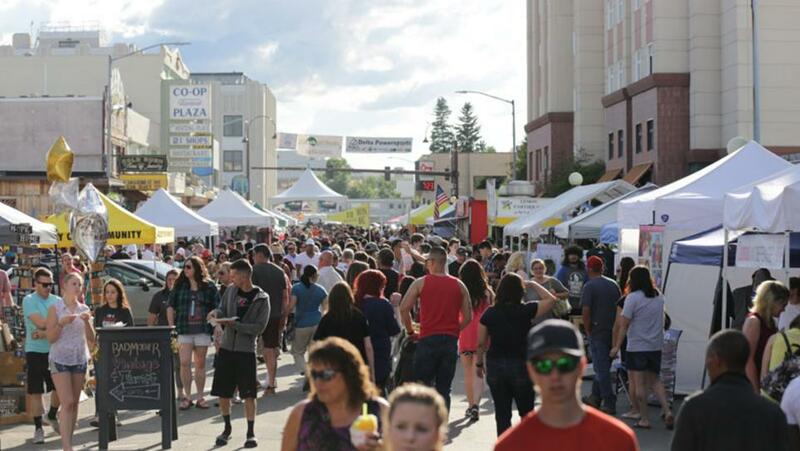 Downtown Fairbanks’ 1st, 2nd, 3rd and 4th avenues become pedestrian only and turn into a huge street fair offering food, drink, merchandise, information and activities. The cornerstones of the festival are four large stages that present 45 live performances including folk, rap, ballet, rock and more. The free festival is in its 37th year but history proves that downtown Fairbanks has been celebrating Summer Solstice in a variety of ways for at least a century. The Midnight Sun Baseball game has been held on June 21st for the past 113 of years and has attracted national attention in outlets such as ESPN, Conde Nast and The New York Times. The game begins at 10 p.m. and continues on until 1 a.m. famously without the use of artificial lights. During the course of the baseball game, people can watch the sunset and begin to rise without the sky ever getting dark. The 36th annual Midnight Sun Run is a quirky Alaskan event that attracts more than 3,500 participants some wearing costumes. Superheroes, bumblebees, swashbucklers and more don running shoes and hit the route at 10 p.m. cruising into and beyond the midnight hour. Not your typical 10K, the Midnight Sun Run winds through neighborhoods where locals host outdoor house parties to cheer on participants. The Arctic Circle just 140 miles north of Fairbanks is defined by the fact that on Summer Solstice, June 21 (occasionally falling on June 20), the sun never dips below the horizon for 24 hours. The midnight sun is fundamental to summertime in Fairbanks and people worldwide come to bask in the sun and participate in these sunshine-inspired, middle-of-the-night events.